Six months after suffering a mild stroke that's largely precluded him from the governance of Indiana's metropolitan church, tomorrow's expected to see the checkered flag come early for Indianapolis' Archbishop Daniel Buechlein. Earlier today, the clergy and staff of the 230,000-member fold were invited to "an announcement of great importance to the archdiocese" which the 73 year-old prelate will make during a 10am press conference at Indy's Catholic Center. According to sources appraised of the situation, the archbishop will announce Pope Benedict's acceptance of his resignation on grounds of ill health two years shy of the mandatory retirement age of 75. 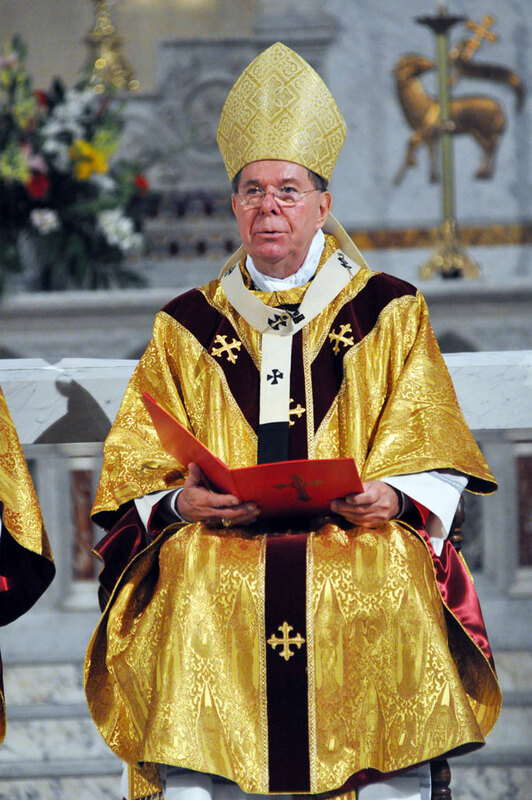 With Buechlein's activity heavily curtailed following his latest illness and its subsequent rehabilitation, the bulk of the archdiocese's administrative burden has since fallen to its first auxiliary in almost eight decades, Bishop Chris Coyne, who was ordained two weeks before the archbishop's stroke. A native of Boston, Coyne had been quickly parachuted into the post in January (photo below) after Buechlein sought an assistant in light of his already precarious condition after years of surgeries and cancer scares. 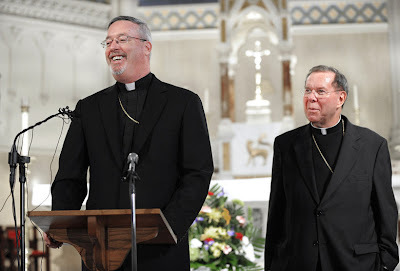 Late last year, the archbishop's initial request of Rome -- namely, a coadjutor -- had been denied, with the Holy See said to have deemed the length of a selection process for a successor as unfeasible to provide for the needs of the Indianapolis church in the immediate term. A blogging, tweeting liturgy scholar whose immersion in social media has won him wide attention over recent months, early indications are that the 53 year-old auxiliary is likely to be named apostolic administrator until the next archbishop is installed. Buechlein's request to retire submitted only in August, the process to select a permanent replacement has yet to be broached. A Benedictine monk, Buechlein (pron: BEEK-line) first rose to prominence at the helm of the Indy church's most well-known Catholic institution, serving as rector of St Meinrad Seminary and president of its adjoining college before his 1987 appointment as bishop of Memphis. Five years later, he was returned to Indianapolis as metropolitan following the premature death of Archbishop Edward O'Meara. A committed "conference man," the archbishop's wider involvement on the national stage has focused on education and catechesis. Buechlein was named a consultor to the Congregation for the Clergy -- the Vatican dicastery overseeing religious instruction -- in 2003. The March stroke was but the latest physical setback to befall Buechlein. In 2008, the archbishop was diagnosed with Hodgskin's lymphoma, which went into remission following surgery and treatment. The following year, he underwent a shoulder replacement, and last year brought surgery for a stomach tumor which was later found to be benign. With the expected move, three mid-size American archdioceses whose prior occupants have historically held a significant role in the leadership of the national church will all be vacant at once: the others, of course, are Denver and Baltimore. While the trio of posts aren't technically on the plane of the nation's "cardinalatial sees," each have been held by prelates who would go on to become princes of the church. In Manchester, "Arise and Walk"
"To Truly Be a Bishop"